The Nashville Predators have signed Hobey Baker Award nominee Rem Pitlick to a two-year, entry-level deal, the club announced on Friday. 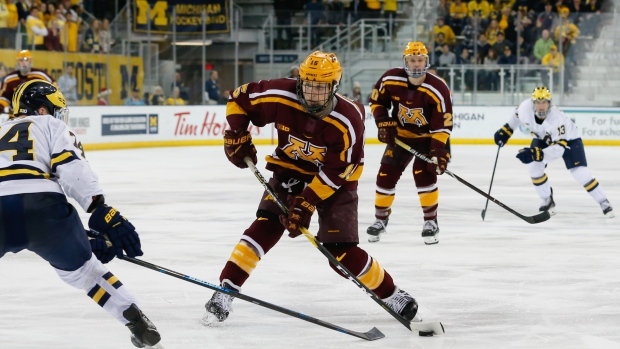 The 21-year-old centre just completed his junior year at Minnesota where he had 21 goals and 24 assists for a Golden Gophers team who fell to Notre Dame in the Big Ten semi-finals. A native of Plymouth, Minn., Pitlick was a third-round selection by the Predators in the 2016 NHL Entry Draft out of the USHL's Muskegon Lumberjacks. Pitlick is the son of former Ottawa Senators and Florida Panthers defenceman Lance Pitlick, and the cousin of Dallas Stars forward Tyler Pitlick.